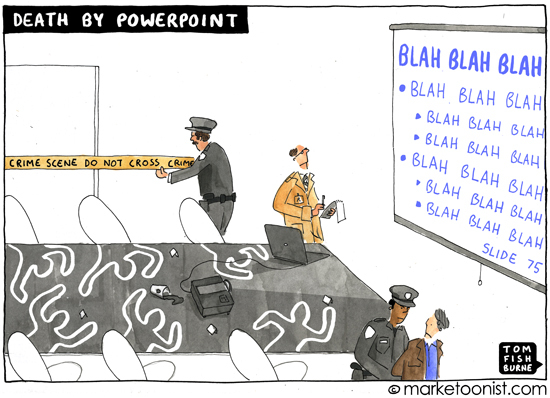 PowerPoint presentations may not have actually killed anyone, but they’ve sure killed many an idea. Our ideas are only as good as how we communicate them. Yet it is common to neuter ideas with mind-numbing slide presentations. We sometimes assume the longer and more verbose the slide deck, the more credibility our idea will have. This cartoon was partly inspired by Dan Roam’s wonderful new book called “Blah Blah Blah: What To Do When Words Don’t Work“. It’s a handbook on getting beyond the “blah blah blah” in any form of communication. Yet too much of communication is “blah blah blah”. And rarely do we see more “blah blah blah” than in PowerPoint presentations. Years ago, I heard an riveting talk by Chris Bangle, who led design for BMW. As he spoke, every slide was nothing more than a hand-drawn stick figure and a few words. 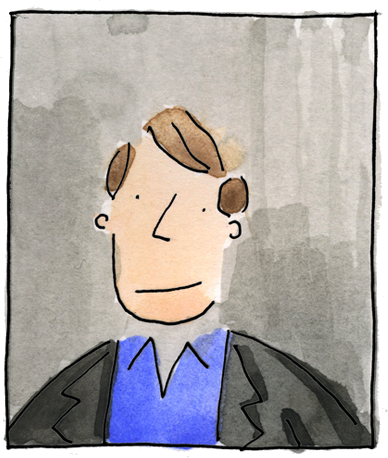 Chris explained he always presented with stick figures, whether at a board meeting or a factory. He said that stick figures forced him to really know what he was talking about, because he couldn’t hide behind a PowerPoint slide. Stick figures also guaranteed that everyone in the room would understand him. Here was one of the most influential design thinkers in the world, and he communicated with stick figures. Science writer John Bohannon recently advocated using modern dance instead of PowerPoint . However we communicate, our ideas are too important to commit idea camouflage. I now use pictures wherever I can in Powerpoint – works much better. And I keep Powerpoints SHORT. Sometimes I use a flipchart, with pages hidden as “reveals” of certain points. That works well. The real issue here is that the Powerpoint stands in for the report, that before Powerpoint, we wrote in Word. For the presentation, we had acetates on which we wrote, or drew some little diagrams. And as acetates on a projector were pretty unreadable, you kept it very short. So the medium has killed the message. About six years ago, our boss had “Just say NO to PowerPoint” stickers printed and he insisted that we all try and avoid using PowerPoint whenever we had to present. After our initial angst had passed, it led to great creativity and ingenuity as we really thought about just who our audience was and figured out a fresh way to get our message across in an impactful, non-PowerPoint way. Mind-numbing presentations certainly get in the way of ideas – but they also mask a lack of ideas. The camouflage of PowerPoint (or Keynote) can not only make thinking difficult to see, it can also hide the absence of thinking. Although you are right, ‘ideas are only as good as we communicate them’ – I am probably more disturbed when there is a poverty of ideas or imagination than by the poor use of PowerPoint. That said, I would champion any accessible software tool that makes the presentation of thinking possible – it may not always be used right, but what a fantastic development for us to have. “People who know what they’re talking about don’t need PowerPoint.” maybe true but “People they’re talking to who don’t know what they’re talking about” often find it incredibly helpful to have visual as well as aural presentation. I am completely on your side. At a recent conference, we were asked to do a presentation about a global event we had initiated. As ever, all the facts and figures were available on the internet anyway, so it was far more important to get the feeling across. Instead of a presebunch of mind-numbing slides, we performed a specially-written rock song. “Visuals” were taken care of by a muppet, a dancing girlie chorus, and of course a flying shark. (We did use slideware to carry the music track and show the lyrics, karaoke style, for the singalong option). It seemed to go down well… and it really got the message across. Oh, how right you are. I was required recently to make a presentation to our local council on what we (the town council) wanted in the planning framework for the next 10 – 15 years. We were limited to 10 minutes. Whilst other towns over ran by as much as 150%, I thought it best to keep within the time scale, emphasising the main points, with powerpoint to assist. The attention span of listeners is limited; far better to make your main points, with details where required in accompanying handouts. If those to whom you are presenting get bored you have failed. As one who has used PowerPoint many many times, I’d say it’s a double-edged sword. At a training class on pres’ns (many years ago, pre-PP), I was taught that the presenter is the hero and the visuals are the backdrops. Many don’t get this. On the other hand, as Tessa points out, delivering some sort of report or linear sequence of information might get done in person today with PP as the tool for illustrations while the speaker replaces written narrative with verbal. And we’d all agree that slides should not be pages of copy. And not all meetings/pres’ns are the same, so there’s a certain amount of “it depends…” in any of these comments. Overall, however, I think the bigger problem today is attention span. Tough to engage a room with your creative commentary while they’re checking emails and pounding their Blackberries — or antsy because they’re not. Creative thinking with true absorption of information in that environment? Good luck. There have been deathly dull presentations for decades; long before PowerPoint. I can’t help but wonder if PowerPoint is the culprit, or if it now makes it agonizingly clear that the speaker’s thoughts are jumbled. As pointed above by some of the comments: the problem is not PPT, it is that we don’t know how to communicatye in the new age of interactive/ YouTube/etc. Making a room full of people (with different pre-conceptions about your project) understand excatly what you want to convey is super hard – no matter if you use words, images, interpretative dance, rock songs or flying sharks (nice one!). We should be pushing schools to teach more COMMUNICATION SKILLS and teach supervisors to ask the 3 key questiosn that will matter to make the idea come accross. Then, only then, people will realize that the “tool” they are using is not helping to get to the desired result. 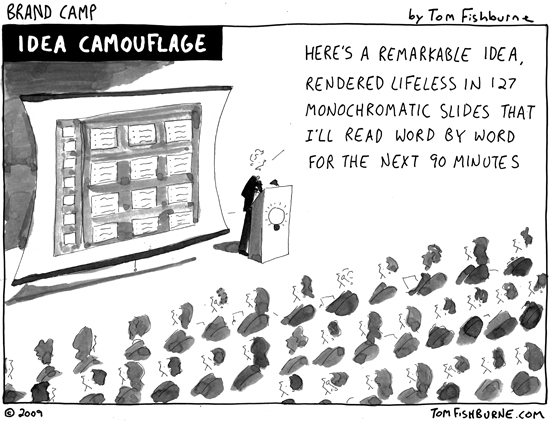 Death by Keynote is very similar to death by PowerPoint, only cooler. Thanks for the great image. I love the idea of a crime scene, since so many presentations involve the use of deadly force through PowerPoint. I would add that the best part is the handcuffed facilitator being led away by the police ~ this reminds us all that PowerPoint is only the weapon of choice, not the perpetrator of the crime. That requires a human touch. 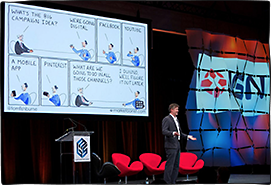 We misuse PowerPoint just like we have misused other media in the past and will undoubtedly do into the future. Those of us who have a message to deliver will forget to meet the needs of their audience in their haste to share what seems so important and clear to them. We think we are communicating because we hear what we want to hear, rather than what we are actually saying. Those of us who fear communicating in public from the “hot seat” will allow that fear to overwhelm our ability to communicate. Reading slides is absolutely mind-numbing, but it is also safe. Those of us who are just doing our job will take the path of least resistance, which may be the biggest sin committed by someone using PowerPoint. Easy to use the template, download all your content to the screen, bullet-point everything, and read the slides (just in case we miss anything). After all, the pay is the same, right? How can you tell the difference between an online collaboration tool and a presentation tool? If the tool requires you to use PowerPoint, it is a presentation tool. You may as well send me the slides and not invite me live. If the tool lets you run a session without ever using a slide, it is a collaboration tool. Let’s work together online and produce something! 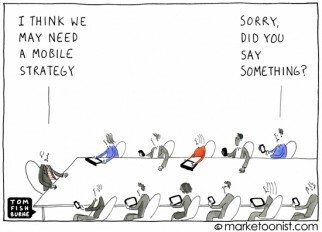 Power Meetings / Power Point – all meaningless. If you can’t speak to a slide with authority and the slide has any more than three – 4 to 5 word comments and a picture on the screen, you lost the audience. This is the dumbing down of America personified. IE: this email vs. speaking to a live person. One of the best presentations I ever heard used at least 200 ppt slides…Jeffrey Gitomer keynoted an Experian annual sales conference a few years ago. His personality and style combined with humorous, simple slides that he zipped through really quickly was epic. (I still remember a few points, such as “Be the best, not Pete Best” – reference to first Beatles drummer. He definitely followed the ideas espoused above, e.g. one simple idea or image per slide. I know my photo-based presentations are better than my bullet-based presentations. But good photo-based presentations take three times as long — if I don’t have the turnaround time, the audience gets bullets instead. My single biggest complaint about powerpoint presentations has always been presenters who put up slide after slide of neatly organized bullet points and then read them to me. Unless you are delivering you presentation to a room full of kindergarteners, your audience knows how to read. If all you are doing is reading to me, you are adding zero value. I can get just as much out of your presentation if you email it to me. Powerpoint should be a prop – not a crutch. I know this is our tendency. I often wonder if this is how our customers feel whenever they meet with a manufacturer. 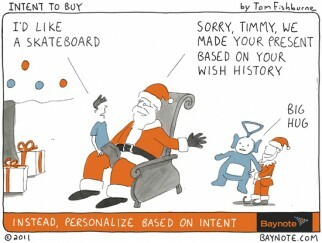 A true collaborative customer relationship would allow you to adapt to their style to deliver your message. Sometimes this is an enormous clash with our culture. Try talking through your presentation with a un-involved listener and have them do your slide outline – see what’s really important! Covey nailed the instruction manual on powerpoint presentations, with habit 2: ‘Begin with the End in mind’. Very few meetings are now about sharing new information. Email does that instead. Most meetings are about linking information together to agree a clear pitcure, and then making desicsions on what to do next. After 20 years in FMCG sales and category marketing, and seeing some absolutly shocking presentations, I now start a meeting/presentation with the Summary slide. These meetings are either very short, or, turn into a good productive discussion. As a presenter using this approach, you can then guide the discussion/thinking using the rest of your presentation (which is immediatley behind the summary…right? 🙂 ) to make sure that the discussion stays on-track and the meeting stays on-time. Recently I was unfortunately in an audience at a conference where a Government bureaucrat got so carried away with the animation “tricks” in her presentation, she started talking about how great they were, totally leaving the thread of the presentation. It’s true – powerpoint can be the crutch that traps many a newbie. On the flip side in its defence I have often found that as someone who has idea diareaha the discipline of having to sort and organise those ideas into meaningful progression for a cold audience helps a lot. Then I just shove all the blah blah in notes so my boss can check what I am going to say and do what I can to rip out the words and replace them with the picture worth 1000 words. and luv ya work – its been the most uplifting and inspiring blog i have subscribed to this year. merry Christmas. I love that cartoon. It is sad that we still have to educate people about the poor use of powerpoint, but we do. I think this is why our free eBook is so popular. Your readers can access it here if ther wish. Actually I just wrote a book against PowerPoint, which will be released the 11th of January in French libraries. You can translate it in english by “ithinkthenislide.com”. Maybe it will have an english edition soon ! Have a nice day without PowerPoint, everyone ! This week’s signed cartoon goes to Hugh Griffiths for reminding us that PowerPoint is actually a remarkable tool when used correctly. They can help bring our ideas to life visually. It’s up to us to use that tool (and any other tools) in a way that adds value. Our ideas need both style and substance. It is said that at, at any given time, there are one million PowerPoint presentations taking place. Chances are, close to a million insomniacs are being cured instantly. If you must use slides, don’t read from them. They should support your story and not simply support your memory. Know your pitch cold, and have nothing more than few prompt notes to keep you on track. PowerPoint is still being used as a script rather than a visual aid or aide-mémoire. Right on autocue, wooden monologues are the order of the day – from Sales Conferences to Annual Reports. The issue seems not to be so much about PowerPoint (or any other similar system like Keynote) but what you do with it. I know many speakers who don’t use PP but still drone on as though they were reading 21 b&w slides verbatim. I know many executives who would be delighted to be told they didn’t have to use PowerPoint – ‘phew, don’t have to work out that damn PowerPoint’ but that wouldn’t on its own enhance creativity – in both instances it of course takes a lot more. I think the trick is to see PP, Keynote, stick figure drawings, images, speech as means to an end which should be used optimally, ideally in combination, to get the result you are after. Good blog and great comments. If you are looking for another good reference to assist a “PowerPoint felon” break the bullet point habit, check out Presentation Zen by Garr Reynolds. This book has definitely helped me unleash my creativity in utilizing interesting visuals in my presentations. Don’t blame the tool, blame the presenter! We are a story-telling species, but we’ve gotten into the habit of imparting data instead. Why? To make sure we look as though we know what we’re talking about? Or to underscore how smart we are? Or is it fear of not looking “buttoned up”? Or is it because we’re taught that data is the language of the executive suite, so our hunger for upper management approval makes data-drones of us all? Often it’s just habit. The typical quant research reports starts with responses to Q1, then Q2, etc. I have to exhort vendors to just TELL THE STORY. The rest can go in the appendix! When I ask vendors why they cling to this approach: “that’s the way eveyone does it” and “our other clients don’t see anything wrong with it.” And we wonder why traditional research is under siege? Thank you for this post! 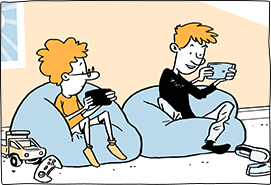 I agree that we all need to rethink how we present our information to encourage engagement!